See Song Designs Blog | For all things DIY, crafty, fun, and fashionable! Today, I’m featuring miss Lindzi Shanks from The Trendy Sparrow for this week’s #WCW! When I think of #GIRLBOSS, Lindzi is definitely the person that comes to mind. Lindzi designs the most amazing tops and home goods that range from fun and cheeky to empowering and inspirational. 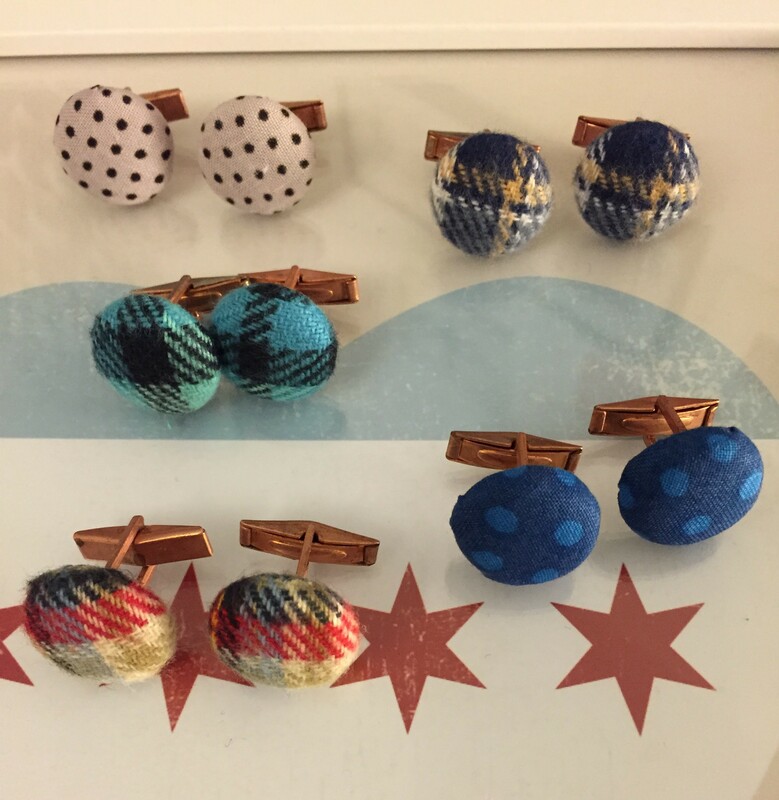 I met Lindzi a few years ago when we were both vendors at a holiday event at West Elm Chicago, and I have since been so impressed with her drive and passion for The Trendy Sparrow. She is definitely an entrepreneur you need to know. Lindzi does it all from running her online shop, to posting on-trend looks for The Trendy Sparrow blog. Read on to learn more about how Lindzi got started with The Trendy Sparrow and what she finds most challenging and rewarding about being an entrepreneur. When did you realize the Trendy Sparrow was going to be your full-time business? I was sitting in one of my graduate school classes at University of Chicago and noticed all of my classmates getting up to leave. Class had ended, but I didn’t even notice. I couldn’t recall what the professor said or anything we learned in class. I had spent the entire duration of class designing new products for The Trendy Sparrow and answering customer emails. It just sort of dawned on me that it was pretty clear which path was making me happier…and it wasn’t school. So I graduated with my MA, decided to not go get a PhD as I planned, and started running The Trendy Sparrow full time before I even graduated. I didn’t even attend my graduation ceremony! What was the most challenging part of starting The Trendy Sparrow? Learning the accounting side of things! I’m still not great at it, and finally opted to hire a full time accountant. I don’t have a degree in anything business related so having to learn the traditional (and important) aspects of running a business such as accounting and proper lingo for things were a big struggle for me. What is the hardest part about running your business now? Intellectual property issues, for sure. I deal so often with other businesses both big and small attempting to duplicate my work. It’s so incredibly frustrating! Unfortunately, it’s something I realized was never going away. Instead I hired an IP attorney who does her best to secure trademarks on everything we make and send cease and desist letters on my behalf. It’s still one of those things that really gets me down though, and makes running a business so much harder. On the flip side, what is the most rewarding part of running The Trendy Sparrow? I love seeing my products in the hands of customers! It’s why Instagram is my favorite social media platform. I get giddy every time someone tags our products in their photos because I love knowing that something I created is making someone happy, or inspired, or stylish. Similarly, I love reading reviews people leave on the site. I want to see how people use the items, why they love them, or how we can improve. What’s a typical day in the life of Lindzi? One of my favorite things of being a business owner is that I don’t really have a typical day. I have certain things that I accomplish each day such as drinking tons of coffee, making sure my emails get answered, and packing up orders. Other than that, my day really changes quite often. Some days I’m designing, others I’m focusing on photography and social media, and some I’m out at meetings. Each day is quite different, and I wouldn’t have it any other way! What has been the most important lesson you’ve learned thus far as an entrepreneur? Although it’s important to delegate and surround yourself with amazing people, at the end of the day…it’s all on you. I once heard someone say, ”I want to be an entrepreneur so that I don’t have to answer to anyone”. The reason is, you answer to EVERYONE. As a business owner, your paycheck is a direct result of your success and hard work. If something goes wrong in any aspect of your company, it affects you more than anyone else. So know that you are going to where multiple hats. You never get to say “that’s not my job” because at the end of the day, everything involving the business is your job. Oh gosh…I would pretty much flip if I saw a photo of Leighton Meester with one of our Blair Waldorf mugs or Alexis Bledel with a Gilmore mug! But mostly my ideal customer is a girl who is a total boss, feels like taking on the world, and wants to look incredibly stylish while she does it! What’s next for the Trendy Sparrow? The next big thing is a huge new line. I can’t give away too many details on it, but expect a ton of new items come Fall 2016! In the meantime, I am focusing on growing my social media presence, my blog, and revamping our online site. What do you like to do in your spare time and how do you unwind? Because I spend most of my day working in an office alone, I really like to get out and see friends to unwind. Even if that means a dinner, a quick drink or coffee, or some gal pal shopping time…it’s getting to spend time with the people I love the most that helps me recharge and unwind. Oh gosh…I feel like I get “obsessed” with things all the time! Right now I’m really obsessed with fashion illustrations. I’ve started drawing some myself. I let myself draw a little bit every night to help the creative juices flowing. I’m also really obsessing over jumpsuits. I have to try so hard not to buy every jumpsuit I see when I go shopping! I totally agree with Lindzi that it’s a vital lesson as an entrepreneur to learn that the outcome of your business is the direct effect of the amount of work and energy you put into it. Thanks so much to Lindzi for letting me interview her for the #WCW post! Make sure you follow Lindzi on Instagram at @thetrendysparrow to get the scoop on her new products and sales while getting some major desk envy and outfit inspiration. I’m so excited to share a new segment here on the See Song Designs blog called Woman Crush Wednesday! Each week, I’ll be interviewing women entrepreneurs who have followed their dreams and paved their own career paths. I really wanted to start a weekly post to highlight not only the glamorous side of running your own business but also the challenges and different perspectives of woman entrepreneurs . Each of these women is so unique and empowering, and I hope you feel inspired by their journeys! Our first #WCW is Natalie Probst from Natalie Probst Photography. I met Natalie a few years ago here in Chicago, and I am constantly in awe of her amazing wedding photography skills. You will see from her photos that she definitely has a talent for capturing love and emotion in her photos. When did you know photography was going to be your full-fledged business? I honestly can’t remember wanting to pursue anything else! I think things clicked back in high school for me, and I knew early on that this is what I wanted to pursue. I was working for a studio photographer who became a great mentor. In my junior year, I began taking photography classes at our local college since photography wasn’t offered through my high school. I realized I had a passion for it and after high school, went on to study photography in college. What was the most challenging part of starting your business? Initially it was just gaining clients. When I moved to Chicago after college, I didn’t have much previous wedding work to show clients even though I had editorial and portrait photography experience. But with every wedding I photographed, I was lucky to have clients who would promote my work and me. A referral is the best compliment you can get! Through referrals and networking with other wedding vendors, my business began to grow. Every day is different, and I’m lucky to be able to set my own schedule. Some days I’m in my home office editing and emailing, others I’m photographing an engagement session or co-working with other wedding vendors. I do find my clients tend to enjoy a glass of champagne as much as I do, so some evenings you can find me getting to know them over a good glass of bubbly. I think sometimes the hardest part is balance. When you run your own business, you tend to work 24/7 and you feel as if you need to. I’m going into my third full wedding season and finally starting to give myself a little grace when it comes to that. Trying to shut the office door at a certain time and enjoy some time with my husband. It’s not always easy but it’s important! I’m lucky to be able to say that my job is SO rewarding. I think the most rewarding part is not only when the couple loves the photos, but when their parents and friends and families love them too. After all, they and their families for generations to come will be enjoying these photos! Since you’ve seen so many weddings and been a bride yourself, do you have any tips for couples for their big day? Oh absolutely! Just like finding a mate, finding a photographer for your wedding is an emotional experience. Not only should you connect with their work, but you should connect with them personally as well. It’s important to find that photographer that not only you can see yourself working with for 8-10 hours on your wedding day, but working with for the year leading up to the wedding. This goes for all of your wedding vendors; find people that you connect with! My dream client is someone who trusts myself and my vision 100%. When a client understands you, your style, and your work, creating images from their day becomes that much easier! Having their trust is everything. How do you unwind, and what do you like to do in your spare time? I’m pretty obsessed with our new 9-week-old dachshund puppy, Millie. We’ve wanted a dachshund for years so it’s crazy that it finally happened! She’s got quite the personality and keeps me on my toes. If you want to see more from Natalie, make sure you check out her Instagram @natalieprobst for more of her stunning photography, and of course, her adorable new puppy! Starting the New Year with this inspirational journal from The Trendy Sparrow! It has been quite the year for me personally and professionally, so it’s a little bittersweet to be ending this chapter of 2015 and moving on to the scary yet shiny and new 2016. I don’t know about you, but I feel that if you write down your goals and share them you’re held a little bit more accountable for if you achieve them or not. I am the worst at asking for help. I’ve always taken great pride in doing things myself, and a little part of me feels like asking for help is a sign of weakness. I full on know that is not true, so I really want to make next year about getting help whether it is in photography, web design, or whatever else. Another rather large goal on the docket is to revamp the Etsy shop and the website. I want to make both the Etsy shop and the website look more cohesive and not like two totally different stores. I love the community of Etsy, but I also love the autonomy of having a standalone e-commerce site. Running both shops can be difficult since pretty much everything that I need to change needs to be changed twice. In addition to running SSD, I work full-time. I also just got engaged which means I am now wedding planning too. I think next year will be a bigger challenge with trying to balance everything, but I really want to make it a priority to feel content with the amount of time I am spending on SSD, my job, and my personal life. I really want to utilize my calendar more and set up specific dates for tasks such as writing blog posts, reconciling the books, designing new pieces, researching new materials, working out, and having date nights. This should probably be more towards the top, but I feel the fact that I am admitting this needs to be improved upon is quite the feat already, right? I feel like I am always making budgets and just not sticking to them. I think it’s especially hard as an entrepreneur because I can justify every purchase as an investment. Since I work full-time, the lines can also get fuzzy when I lump my salary and small business income together. That is a huge no-no in the small business world, so I am going to try extra hard this year to budget for myself personally but also for SSD. It also helps that I am planning a wedding now which will hopefully force me to save way more than before. I’m the type of person that’s always looking forward to/dreading what’s coming up. I feel like I’m always looking forward to my next big vacation or dreading an upcoming deadline. I really want to make it a priority this year to really appreciate what’s going on right now. I want to enjoy wedding planning and not see it as a chore and I want to celebrate any little victories I accomplish with my jewelry. Since my twenties are nearing an end, I think it’s more important than ever to really enjoy life with my loved ones in the moment. Maybe I should just call this my YOLO goal? What are your priorities for the upcoming year? Do you have any tips on how you accomplish your goals? I am all ears and would love to hear what you think. I am wishing you all the best in the new year, and I hope you have a happy and successful 2016! I hope you all have a great holiday with family and friends and lots of love and sparkles (of course)! I’m so grateful for all of your love and support over the years. See Song Designs is definitely a passion project and I love designing and making jewelry for you. I’m looking forward to lots of yummy food this weekend and seeing all of my family. I hope you all have a very Merry Christmas and happy holidays! Today, I am sharing a super simple DIY for cufflinks, and each pair only takes a minute to make! These button cufflinks are the perfect holiday present for the dapper gentleman in your life. Plus, the possibilities are endless, so you can gift these for all sorts of occasions! First you will need to start with making your buttons. You can use any type of fabric, but I would recommend using a medium weight fabric and to stay away from sheer fabric. You will only need about 2 sq. in. 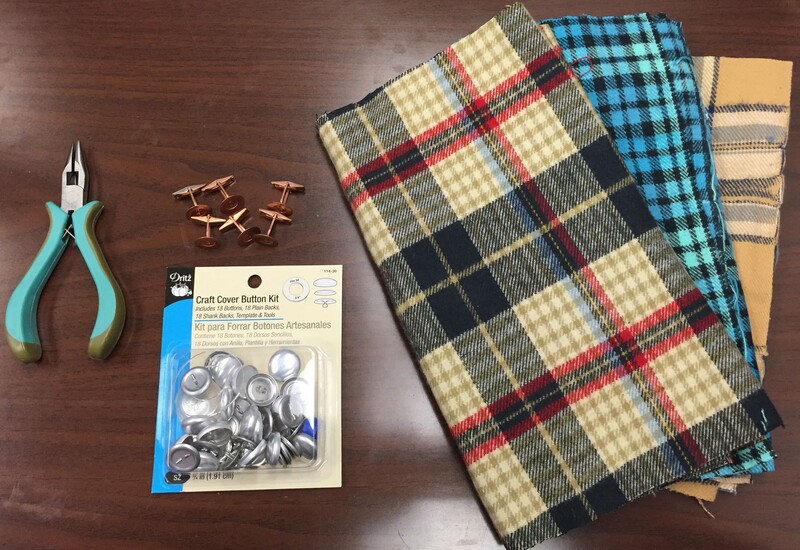 of fabric for each cuff link, so you could just use left over scrap fabric or you can go and buy fabric. At Joann’s Fabrics, you can get fabric cut to as little as 2 inches which is great for this project. I ended up getting some flannel from Joann’s. I just got 1/4 of a yard of each fabric for $1.50 each. This is actually way more fabric than I need for the cuff links, but I plan on doing another DIY with the leftover fabric. The button cover kit will come with instructions on the back, and they are very easy and simple to follow. The button kit will come with a stencil of a circle that you can use to trace your fabric. Once your fabric is traced and cut out, you will align your fabric with the button mold, right side down. Next, you will put the button blank on top of the fabric and use the little button pusher to push the blank into the mold which ends up wrapping the fabric around the button. You will need to make sure that the excess fabric is wrapped around the button and gathered inside the button. Take the cap of the button and remove the button hole with your pliers by squeezing the wire and pulling it out. Once you have your flat button cap you will take that piece and push it into the mold with the the button. This may take a few pushes, but you will see when the backing of the button is snapped into the button. Once your buttons are finished, you will need to glue them into the cuff link blanks. I recommend that you let these dry with the button facing down so that the cuff link blanks don’t move off center as they dry. You should let these dry for a few hours before any heavy handling. The possibilities really are endless for this project. If your man has a favorite sports team, you can easily find patterned licensed fabric online for this project as well. 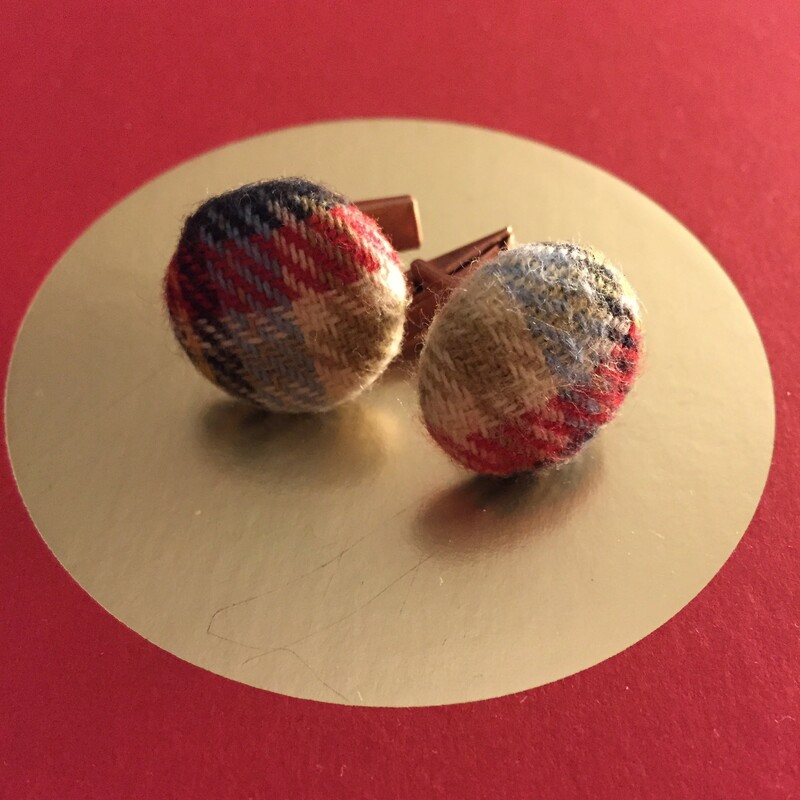 I also love the idea of using his favorite old shirts to make these cuff links even more sentimental! I hope that this inspires you to DIY some gifts this holiday season, and I would love to see pictures of your finished cuff links! Just use #SSDDIY on Twitter, Facebook, or Instagram to share!